is all on that album.” John Rodman. It’s a beautiful day in Tennessee. The sound of rushing water echoes through the woods as creeks and streams are over flowing with the spring melt. Children laugh and scream as they gather at their banks to launch hand made vessels of sticks, leaves and other floating debris. Off in the distance, they hear the song of a mocking bird as it gathers the last of the berries off of a juniper. All together it plays a symphony called Spring. There they sit, on a bench in the middle of their favorite spot in the world. Although the sun is warm and bright, the March winds sends a cold chill down her spine causing her to shiver. Without question, he wraps his arm around her shoulders and brings her in tight. She snuggles close to him, as she draws warmth by his touch. His lips gently grace the top of her head as she rests her ear upon his heart. Beat, beat. Beat, beat. Two hearts become one just as two musical instruments produce a beautiful song. For more than forty years, John and Judy Rodman have marched to the beat of their own drum while navigating through the music industry. Separately they have accomplished some, but together they have accomplished much more. Judy is no stranger in the music industry. Born in California, she began to sing at the bright age of four. By her eighth birthday, she was on her way to mastering the guitar and was soon singing along side her father in his band. At the age of seventeen, Judy began singing commercial jingles. She would go on to earn a portion of her living as a background singer to many country music singers. It was through this job that she met drummer John Rodman. “Go ahead...” states John when asked how they met. “I forgot he came along...” laughs Judy. Although John’s name is rarely recognized, he is no stranger to the music industry as well. “I grew up in Memphis.” tells John. “I went through school as a legitimate player. I also had a rock-n-roll band in high school. I was doing legitimate stuff while I was in the rock-n-roll band and went through college. I played in the symphony and taught for a year at the University of Memphis. I played numerous country club dances. Together John and Judy worked at creating and performing commercial jingles. In the 1980’s Judy chose to return to become a background singer, this time for entertainers like Johnny Cash, Tammy Wynette and Ray Charles. This would eventually lead Judy to adventure into a solo career. Judy signed with MTM Records and recorded songs like “I’ve Been Had By Love Before,” “You’re Gonna Miss Me When I’m Gone,” “Girls Ride Horses Too” and her signature song “Until I Met You.” Her short lived solo career earned her the title of ACM’s Top Female Vocalist in 1985. Just as Judy was about to release her third album, her record label folded. Even though her singles were gaining attention, other record labels felt there wasn’t enough interest in Judy’s music to sign her to a record contract. Like so many others before and so many even today, Judy simply faded into the dark recesses of the stage. However, she didn’t fade into oblivion. Judy continued to play her part in the music industry as a vocal coach, recording studio producer and most of all songwriter with hundreds of songs in her catalog. But what goes around must eventually comes back around to the beginning. As the story goes, while watching television one night, John and Judy were inspired to return to the studio to create their first album together. 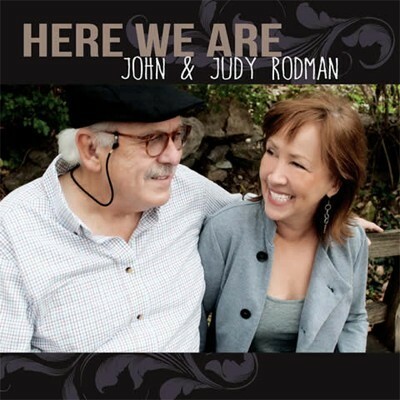 On March 24, 2015, John and Judy will officially release their new album called Here We Are, on Rivermoon Records. Here We Are consists of seven beautiful songs, six of which are co-written by John and Judy. The album opens with “Somethin’ Like That.” The Rodmans give credit to their son Peter for coming up with the guitar groove that is carried throughout the song. Performed as a mid 1980’s beat, this one contains a catchy chorus that rides among the waves produced by that unique guitar groove. “Still Breathing” begins with a simple gentle melody that is lifted with John’s drums and guitars. Judy gives a commanding performance as she draws from personal experiences as she puts forth pure, raw emotions within her vocals to create a drama within the song.. Performed as a Cher-esc, 1980’s style song, this one is sure to lift your spirits as it promotes hope for survival. Back in the day, when music was real, many songs contained a center that was filled with an instrumental piece that generally connected two or more verses of the song. The reason song writers did this, was due to two reasons. The first reason was the song already contained enough story or power within the lyrics that by adding more lyrics, it would simply destroy the song. The second reason, was to showcase the various talents of the instrumentalists. But more so, many singers would shorten a song by adding an instrumental, due to laziness. John and Judy bring back this unique song writing skill with their masterpiece “When The Day Is Over.” Performed as a gentle, relaxing, heartfelt love ballad, this is one song in which the Rodman’s truly open up to the listener and showcase their love for one another. The song captures the essence of the moment when dusk turns to night as two people feel blessed to have shared another day with each other. The central instrumental captures pure emotions of love and gratefulness, more than words can. It also brings a light sense of faith with it’s Gospel-esc feel that rides the pearl white keys of a piano and keyboard. This song is the epitome of what a well written song is all about. This is one of three songs, from this album that will hit our list of Top Songs of 2015, while earning a nomination for the Spirit Award’s Song of The Year Award. The album continues with “Something Bad.” The Rodmans draw from John’s childhood as the song is performed in a style known as Memphis Blues. One can truly hear John’s talent on the drums as Judy captures the negativity of a ‘player’ within her talented vocals. The pure artistry of this album is completely found in the fifth cut called “There We Are.” This song is so simplistic with very few lyrics, but it is also quite elegant within the instrumentals. The artistry and professionalism is truly found in this heartfelt love ballad. John and Judy take music professionalism to a new level as they are able to incorporate the right instrumentals, in all the right places, to capture the emotions of what the lyrics are trying to tell the listener. Their addition of the simple but elegant flute adds more to the song than lyrics ever will. Although this song is a story of John and Judy, this is one song that many will be able to relate too. With its simplistic but alluring lyrics, this one would make for a beautiful song perfect for any wedding, especially those who are renewing their vows. This beautiful ballad will hit our list of top songs of 2015, while earning a nomination for the Spirit Award’s Song of The Year Award. So far on this album we have heard a wide variety of songs that include melodies found in blues, pop and classic country. John and Judy give us a bit of Rhythm and Blues with “You Want It Back.” Performed with a Blues Brothers feel to it, this song brings us back in time with its classic feel mixed with incredible vocals. The album closes with the final song we have chosen, from this album, to hit our list of Top Songs of 2015 while earning a nomination for the Spirit Award’s Song of The Year Award. John and Judy could not have chosen a better song than “Sweet Dreams,” to close out this extraordinary album. If a picture can paint a thousand words, than an instrumental can bring forth a thousand emotions. I don’t know if there are a thousand emotions, but an instrumental like this jars loose a thousand memories. Performed as a gentle adult lullaby, “Sweet Dreams” brings a natural closure to this already beautiful album. The song does capture the beauty of each of the souls who worked hard on this album, while it relaxes the listener’s soul. It’s a song that one can find comfort and peace while it resinates through the speakers. As the album closes, it gives you a sense of completion. Each of the songs on this album refers to the events and emotions that one may endure in a single day, week, month or year. At the end of the day it’s all about survival, love and spending your life with that one special person. The pure gentle emotions found in “Sweet Dreams” reminds us of what is important in our lives while it takes away the harshness of the day. John and Judy Rodman set out to create an album filled with pure music that created magic and prompts memories for years to come. What they ended up creating was a masterpiece filled with a symphony of songs, generated by years of experience, that is coveted by faith, love, honor and respect for one another. Together they share their passion for life, love and the pursuit of a great song. To them, a great song is one that you can relate too, one that will prompt loss memories and create new memories. You will not find John and Judy performing in a big venues filled with screaming fans. But, they would rather perform in front of people who appreciate good music by devoting their attention to the live performance. It’s because of this mentality mixed with the pure raw emotions drawn by life’s experiences, that we pull this album and nominate it for the Spirit Award’s Album of The Year Award. John and Judy will join us as we feature this album on our Friday night radio show - Around The Campfire on March 25, 2015. During the show, you will be able to enter to win a free autographed copy of this incredible album. For over forty years they have been producing a symphony filled with love, passion, honor, respect and gratitude within their music. As John and Judy sit upon the bench listening to Mother Nature’s symphony, they believe that they have come full circle. For the two have finally come together, musically, to create not just an album - but a masterpiece.